The U.S. 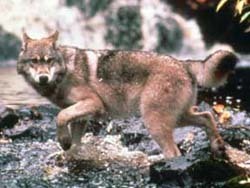 Fish and Wildlife Service is removing gray wolves from the federal endangered species list. The agency on Wednesday lifted the protected status of gray wolves living in the western Great Lakes states and Northern Rocky Mountains. The decision puts about 550 gray wolves back under the management of the Department of Natural Resources. DNR wildlife biologist Adrian Wydeven says that control will allow the state to issue permits to help control the wolf population, a move that is sometimes necessary when they begin attacking livestock and pets on private property. Previous efforts to de-list gray wolves have been overturned by the courts, when a federal judge sided with an animal rights group that sued. The rules adopted on Wednesday address the issues raised in that court case.